1. Use of Garden Council Headquarters for classes, flower shows, specific greenhouse occasions, workshops, educational shows and club meetings at the Garden Club Council Headquarter subject to the convenience of the master schedule. If you’d like to reserve the Education Room at Reynolda Gardens, please contact Amanda Lanier, lanieral@wfu.edu, or 336-758-3485. 3. Complimentary use of our library at Headquarters. All members can check out books free of charge. 4. Ability to apply for Council Awards including: the Nancy Dennis Sherk Award for Achievement in Beautification and the Wava Howard award which is given annually to a living member of the Garden Club Council who has done the most over a period of years to further its projects and objectives. 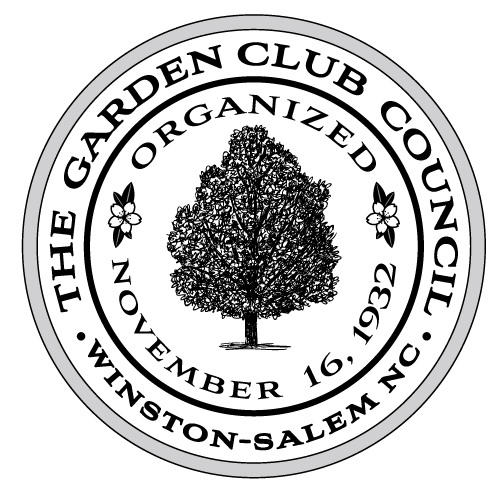 All members of the Garden Club Council of Winston-Salem/Forsyth County are also members of the Garden Club of North Carolina and receive those benefits as well. All members clubs can hold classes, flower shows, specific greenhouse occasions, workshops, educational shows and club meetings at the Garden Club Council Headquarter subject to the convenience of the master schedule. All meetings and events must be by reservation only and scheduled through Reynolda Gardens. All clubs or organizations using Headquarters for meetings, workshops, etc. shall be responsible for cleaning before and leaving facilities in the same condition in which they were found. LOCAL: The deadline for paying dues to the Garden Club Council is March 31. The annual dues for each club member is $7. A club roster listing the President and Treasurer and their email addresses, all club members (first and last names, husbands’ names, street addresses, zip codes, telephone number) and club meeting day and time must be sent to Council Headquarters with the dues check. STATE: The deadline for paying dues to The Garden Club of North Carolina, Inc. is March 31. The annual dues for each club member is $8.00. A club roster is sent each year to the club President, usually in January. This roster should be updated as necessary and must be sent to State Council Headquarters with the dues check. Club dues shall be delinquent after April 1. ***For each new member admitted during the year, send $8.00, name, mailing address, club name and district number to State Headquarters.